RED just announced their new RED EPIC flagship video camera at NAB, which uses a new, full-frame S35mm Mysterium X sensor. The Mysterium X matches the quality of 35mm film at 5k resolution and one ups the 4k Mysterium sensor found in the RED ONE. 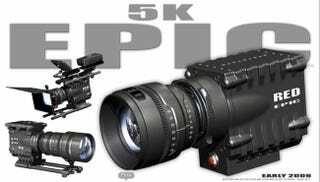 The EPIC can also shoot framerates up to 100 FPS. * FULLY UPGRADABLE SENSOR, BODY, BOARDS AND MOUNT.